Calling all anglophiles! 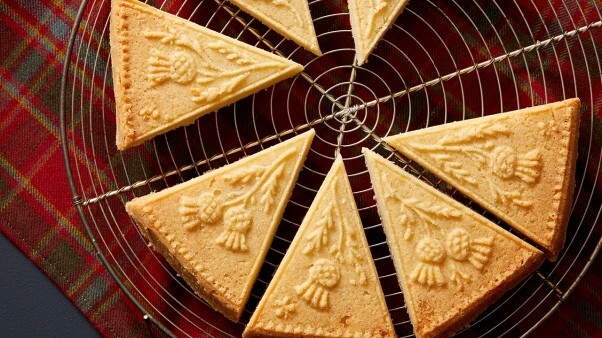 Join Martha as she shares three classic cookies, or as they say, “biscuits” from Great Britain: traditional English shortbread baked in a ceramic mold, Welsh Bakestones, an interesting cross between a chubby cookie and a scone, and Celtic knots known for their intricate trefoil pattern. Delicious for teatime or anytime! Make Martha Stewart's Celtic Knot Cookies from the Cookies of Great Britain episode of Martha Bakes. Preheat oven to 350 degrees. Spread anise and caraway seeds in a single layer on a rimmed baking sheet. Toast until fragrant, 5 to 8 minutes. Let cool completely. Coarsely grind toasted seeds with a mortar and pestle, or in a spice grinder. In a medium bowl, whisk together ground seeds, flour, and salt. Set aside. In the bowl of an electric mixer fitted with the paddle attachment, beat together butter and sugar on medium-high speed until well combined, 2 to 3 minutes. Add eggs, one at a time, beating to combine after each addition and scraping down sides of bowl as needed, then beat in vanilla. Continue beating until light and fluffy, about 2 minutes. Reduce speed to low and beat in flour mixture until just combined. Transfer dough to a floured surface and knead gently. Divide dough in half. Shape each half into a 1-inch-thick disk, wrap in plastic, and refrigerate overnight. To make knots, measure 1 heaping tablespoon of dough; roll into a ball. Transfer to a floured surface; roll into a rope about 12 inches in length and 3/8 inch in diameter. Shape rope into a trefoil design on a parchment-lined baking sheet. Gently press dough at ends and at each intersection to adhere. Measure 1 scant tablespoon of dough; roll into a ball. Transfer to a floured surface; roll into a rope about 8 inches in length and 3/8 inch in diameter. Form into a circle about 3 inches in diameter, pinching ends to form a ring. Center ring on top of trefoil design and gently press to adhere. Repeat with remaining dough (4 to 6 cookies per sheet). Freeze until firm, 25 to 30 minutes. Bake, rotating sheets halfway through, until lightly golden brown on edges, 15 minutes. Let cool on sheets 5 minutes, then transfer cookies to a wire rack and let cool completely. Cookies can be stored in an airtight container at room temperature up to 1 week. Dust with confectioners' sugar just before serving, if desired.